Almost a year ago when I concocted my wine tasting plan (which eventually resulted in beginning this blog), I mostly noted various regions or appellations around the world that I wanted to try. I listed only a handful of very specific wines, but for the Santa Cruz Mountain region of California I wrote that I wanted to try the Ridge Monte Bello. I can guarantee you that I never considered the possibility of being invited to a wine blogger’s tasting and tasting a vertical of that very wine. 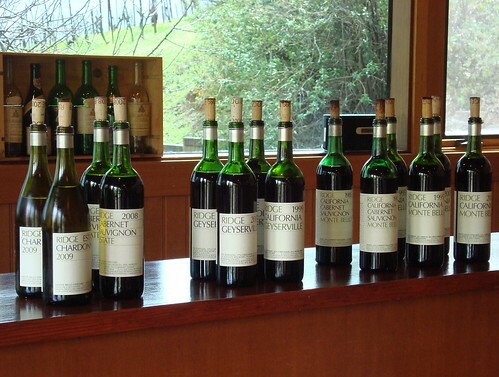 But that is exactly what happened, as last Friday I was invited to a private tasting at Ridge’s Monte Bello tasting room where I tasted three different Monte Bellos as well as several other fantastic Ridge wines. I’ve come a long way in the last 10 months in my wine education, as well as my collecting. 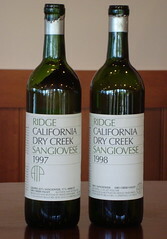 I bought several bottles of Ridge (including a 2006 Monte Bello that I won’t be drinking anytime in the next decade!) last fall, as well as half a case of a special wine Ridge’s winemaker Paul Draper made for the Stanford Wine Program’s 30th anniversary. 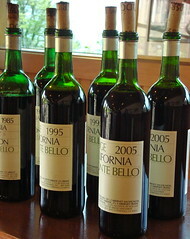 I had the opportunity to try the 1992 Montebello at my wine club’s holiday party last December. And well, needless to say, I was pretty excited as I wound up the mountain towards the tasting room. On Thursday we’d had a pretty spectacular rainstorm, and things looked pretty rough around the edges on Monte Bello Road. The rain continued to fall as I went up and up. 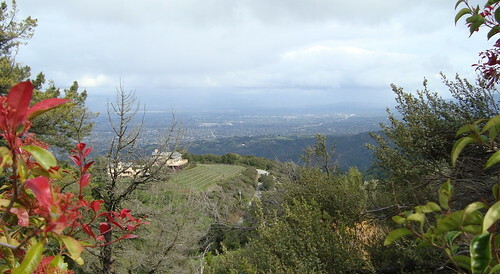 I hate driving, especially in the rain, on freeways, and mountain roads, but the wine beckoned. I’ll gloss over the part of the afternoon where I felt a bit intimidated, surrounded as I was by people whose twitter following is more than two digits, who have wineries send them wine samples (samples! I’d be happy if they just sent me a coupon), and skip to the part of the afternoon where I settled in, sipped- and spat most of- the wine, ate delicious cheeses and thought to myself: perhaps I should seriously consider a full-on career change to the wine industry. A barrel-fermented, American oak aged, full malolactic fermented chardonnay with a creamy nose. Good acidity, very creamy with a pretty full body and- YUM! Outside of the white Burgundies I’ve been tasting lately, the most exciting chardonnays I’ve had are certainly coming from the Santa Cruz mountains. Shame on all the producers that made me shun the grape for years with all that awful over-oaking! Red fruit on the nose, but soft. Again, good acid and certainly not as heavy as most CA cabs with soft tannins. A simple, and pleasurable, wine. (At this point in the tasting it began to hail outside, which I recorded in my tasting notes). Besides the Monte Bello, I’d say Ridge’s specialty is zinfandel heavy “field blends”- I have several of these in my collection. This one was 58% zinfinadel, 16% carignane and 16% petit sirah. I got a little milk chocolate and some red fruit on the nose (I ♥ chocolatey zin). It was really tasty, smooth with raspberry fruit and wasn’t too heavy. I would be happy to drink this wine now, even though it clearly can, and probably should, age. The exact blend varies each year and this one was 74% zin, 17% carignane, 2% petit sirah and 1% each of two others that I missed and didn’t get down in my notes. It had a very earthy, perhaps a little funky, nose. But still had good acidity, tannins and the like. It seemed like it would go great with food, so this is when I started helping myself to the fresh bread and cheese on the table. I missed jotting down the exact blend in this one (lesson learned for future tastings!). On the nose a little dried fruit, maybe cherries, and a bit of a soft herbal scent. The wine was very smooth with just a hint of tannins. Still had acid, some pepper and fruit. Also note, this ties for the oldest wine I’ve ever tried-thanks, Ridge!- and it was nice. This one was 69% cabernet sauvignon, 18% merlot with the remainder petite verdot and cabernet franc. The color of the wine still looked pretty young. This was a strong wine (conversation amongst attendants commenced about what type of psychological therapy this brawny wine would seek versus the more supple 1985). On the nose, the wine was dense with pepper and spice. You could just tell it was going to be a powerful wine. And it was- strong tannins and structure, but balanced with acidity. The black pepper carried over and it had that chewy leather taste. This wine, especially after the previous two, was obviously still young and fresh. It was a bit biting- strong and firm, but not overpowering. The tannins and acid struck a nice balance along with pepper and red fruit. I noted that the wine could obviously use more time, but was nice to drink now. Holding onto wine for a decade or two is still a concept I can’t quite grasp! This wine also contained 10% viognier and 8% grenache. After warning us that this wine is gone (literally the third and second to last bottles were poured into our glasses), many of us, myself included, found this to be a really fantastic wine. It had a much brighter nose than the Monte Bellos with lighter fruit. True to type it was peppery, but the viognier’s floral component was present as well. Really, really tasty- and went really well with the soft, stinky cheese I couldn’t stop eating. This was 92% syrah and 8% viognier. It had a richer nose than the ’04, more fruit and less pepper. The wine had lots of fruit and was very floral with a medium body. I also have in my notes “very sm”. I can’t figure out what that could possibly mean except that I must have again gotten distracted by eating cheese and gushing about this wine. This one hasn’t been released yet- it goes out to members next month. I can guarantee, however, that I will be reserving an allocation for our household. This was my favorite wine of the day! One of the other bloggers (whose name I didn’t note, shame on me) brought two “mystery” wines for us to taste blind. Uh-oh, novice at the table! No way I was going to correctly guess these wines. I couldn’t quite place the nose on this one and the color showed age. It still had tannins but not very strong fruit. No matter how many times I tried this wine though, it just tasted like pretzels. This one smelled almost like it was fortified, with hints of dried or caramelized fruit. It was a brambly wine, with some fruit, soft tannins and more pepper than wine #1. No one was able to correctly guess the wines (I think it helped that Ridge no longer makes it), though I still felt like a amateur. Wine 1 was the 1997 Dry Creek Sangiovese (which also used some merlot that year) and wine 2 was the 1998 Dry Creek Sangiovese. Have to say, these were my two least favorite wines of the afternoon, and I don’t think it was just because they reminded me that tasting is currently the weakest link of my wine aptitude. By this point in the afternoon it had stopped raining. I was purple-toothed, full of cheese and “real life” summoned me back down the mountain. The day was fabulously educational and fun- can’t wait to do it again! I only gathered the cards of my immediate table mates, but here are their blogs: Barton Orchard, NorCal Wine, Uncorked (the K&L Wine Blog), and Wine Maven in Training. I'll post links as I find them from other attendees.